One of the largest and most accomplished intellectual property dispute teams in the Midwest. Calfee’s Patent Litigation practice includes a bench of patent attorneys with deep experience in all aspects of patent litigation, including discovery, claim construction, summary judgment, trial, and appeals to the Court of Appeals for the Federal Circuit. Calfee’s patent litigators are involved in offensive and defensive client representations in a wide range of technologies including the mechanical, electrical, software, and chemical arts. Calfee has one of the largest and most accomplished intellectual property dispute teams in the Midwest. Serving a broad spectrum of publicly and privately held companies, our attorneys represent plaintiffs and defendants with respect to patent, copyright, trade secret, trademark, trade dress, product configuration, unfair competition, and licensing claims. Our attorneys focus on all major scientific disciplines including mechanical and electrical engineering, chemistry, biotechnology, computer hardware, software and circuit design, and semiconductors. 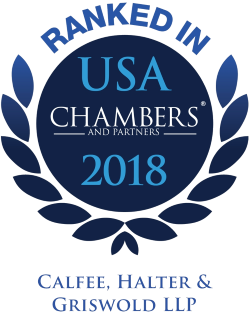 The Calfee team consists of experienced first-chair litigators who have handled matters before all manner of federal and state courts, the U.S. Patent and Trademark Office, the U.S. Customs Office, International Trade Commission, and Federal Trade Commission. Calfee combines diligence and attention to detail with a sensitivity to our clients’ economic and strategic goals in working to resolve complex intellectual property disputes – matching the demands of each case with the firm’s resources both efficiently and effectively. In addition, Calfee’s team includes former law clerks and patent examiners who bring unique insight and experience to disputes that are legally and technically complex. This focus on efficient dispute resolution puts Calfee at the forefront of the IPR practice since those proceedings were first created in 2012. In the last three years alone, Calfee attorneys have been involved with more than 20 IPRs, in cases ranging from medical devices and communication equipment to consumer products and packaging. This experience, combined with a favorable, Ohio-based cost structure, have allowed our clients to succeed in patent disputes faster and less expensively than in traditional litigation. The litigators in our Intellectual Property group have gained extensive and valuable intellectual property litigation experience dating back to the 1980s when the group was formed. At any given day, Calfee has a dozen or more attorneys in the group devoting all or substantially all of their time to intellectual property litigation. Calfee’s IP litigators also are supported by and can draw upon the sophisticated case management technology and personnel of Calfee’s extensive general litigation practice if needed. In addition, our firm has extensive experience in providing opinions and “design around” advice to assist our clients in penetrating new markets and creating new product lines. Virtually every day, Calfee attorneys are preparing opinions or providing advice with respect to avoiding patent conflicts while achieving the business goals of entering new markets. As with every aspect of our practice, we take into account a client’s goals and comfort level with respect to any particular product. Our intellectual property litigators have represented clients in trial courts in many of the 50 states and have briefed and argued cases to the Court of Appeals for the Federal Circuit and other appellate courts. These litigators have successfully represented clients in trademark, trade dress, or unfair competition cases involving a wide range of consumer and industrial products and services. Many of these matters were for clients whose patent or trademark portfolio also is maintained by Calfee. Additionally, understanding that intellectual property litigation can be very expensive, Calfee often will explore alternatives to one-size-fits-all, “full blown” litigation, such as alternate dispute resolution, creative staffing, and parallel negotiation/litigation. Calfee’s patent practice is regularly called on to provide a spectrum of opinions, including defensive opinions such as non-infringement and invalidity opinions. Calfee also is called upon to provide Rule 11 analyses and opinions regarding third-party competitors' infringement of our clients' patents. Calfee is routinely asked to provide second opinions of other firms' patent opinions. Our opinion work is centered around potential new product launches in mechanical, chemical or electrical/software arts. In this regard, Calfee has developed various strategies for searching and analyzing a wide range of patent landscapes to meet available client budgets. We employ a two-attorney review of all opinions to ensure that all reasonable positions have been considered. One of the two attorneys is typically an experienced patent litigator who brings a litigation perspective to the opinion process. Calfee’s opinions have taken a wide range of forms, including formal written work product (ranging from being more summary to extremely detailed in nature), graphical (e.g., PowerPoint) presentations, and combinations of the foregoing. Along with opinions, Calfee’s patent practice is routinely called upon to provide counseling on a wide range of matters, including competitive patent portfolio analyses and threats, design-around, non-infringement, invalidity positions, as well as due diligence for patent-related mergers and acquisitions. For new business ventures or new product designs, our patent practice has significant experience analyzing competitor patent portfolios and counseling business unit leaders on associated risks and design-around alternatives. Calfee’s patent practice is relied upon daily by many Fortune 1000 companies. Brita Wasser-Filter Systems v. Recovery Eng., et al., Case No. 97 C 3915 (N.D. Ill.). Won summary judgement of non-infringement of water filtration pitcher patent after successful Markman hearing. 41 F.Supp. 2d 818. Won affirmance of judgement on appeal to Federal Circuit. Joao Bock Transaction Systems v. KeyBank N.A., Case No. 7:14-cv-02883-WWE (S.D.N.Y.). Patent claims for securitization systems for online banking transactions. Moved to dismiss complaint at the pleadings stage on the basis that the patent-in-suit involved a mere abstract idea, which was not patentable subject matter under recent Supreme Court precedent. A prompt settlement was obtained. Citrix Systems, Inc. et al v. 01 Communique Laboratory, Inc., Case No. 2:14-cv-04185 (C.D. CA). Defended global software company in patent infringement claim, resulting in jury verdict of non-infringement. Maxim Integrated Products, Patent Litigation, Case No. 2:12-mc-00244 (W.D. Pa.). Defended patent claim to operability of mobile banking applications when running on smart phones. TQP Development, LLC v. KeyCorp, Case No. 2:12-cv-00058-DF (E.D. Tex.). Patent claims for online banking use of secured Internet communications. Negotiated settlement. Teva Pharmaceuticals USA Inc. et al v. Forest Laboratories Inc., Case No. 1:13-cv-02002 (D. Del.). Lead counsel for two global pharmaceutical companies as plaintiffs in a patent infringement case involving an Alzheimer’s drug, which resulted in a settlement on the day before trial. Obtained favorable claim constructions and prevailed in several dispositive disputes. Integrated Technology Corporation v. Rudolph Technologies, Inc., Case No. 1:06-CV-2182 (D. Az.). $40 million verdict against a public company for years of infringement. Awarded nearly $2 million in attorneys’ fees for defendant’s misconduct. Successfully defeated Supreme Court petition for certiorari. MTD v. Toro (multiple cases). Represented MTD in a series of patent enforcement actions against Toro. Fortune Brands (multiple cases). Represented multiple Fortune Brands entities, including Moen and Master Lock, in patent enforcement actions and in defense against patent claims across the United States. Results include consent judgments, license payments, and injunctions when on the plaintiff’s side and negotiated settlements when on the defense side. Velocys Inc. and Battelle Memorial Institute v. Catacel Corp., Case No. 5:10-cv-00747 (N.D. Ohio). Patent litigation involving multiple patents for Battelle spinoff. Won sanctions against opposing counsel and defendant. Obtained negotiated settlement. Atotech USA Inc. et al. v. Macdermid Inc., Case No. 2-05-cv-05517 (D. N.J.). Patent and trade secret litigation on behalf of leading chemical maker. Obtained negotiated settlement on behalf of patent owner. InterDesign, Inc. v. Merrick Engineering, Inc., Case No. 1:16-cv-02498 (N.D. Ohio). Design patent litigation for consumer products maker. Represented a design company in promptly obtaining stipulation and order to stop sale of defendants infringing products. Successfully enforced patents against competitor. United States Endoscopy Group, Inc. v. ConMed Endoscopic Technologies, Inc. et al., Case No. 1:06-cv-01253 (N.D. Ohio). Enforcement of patents against competitor and defense of antitrust claims. Obtained prompt settlement. Hytera Communications Corp. Ltd. v. Motorola Solutions, Inc., Case No. 1:17-cv-01794 (N.D. Ohio). Currently representing world’s second-largest mobile radio maker in first U.S. enforcement action. DISH Network. Since 2008, we have represented DISH Network in a very significant Lanham Act unfair competition matter; case recently settled. MRI Software LLC v. Lynx Systems Inc., Case No. 1:12-cv-01082 (N.D. Ohio). Lead counsel for global software company in case involving copyright and trademark infringement and trade secret misappropriation. Promptly obtained entry of preliminary injunction on behalf of the plaintiff. The case was favorably settled. LBS Innovations LLC v. BP America Inc., et al., Case No. 2:11-cv-00407-DF (E.D. Tex.). Patent claims to operability of geo-location functionality on website. Successfully invoked indemnification. Stambler v. Intuit Inc., et al., Case No. 2:10-cv-00181 (E.D. Tex.). Patent claims for online banking use of secured internet communications. Negotiated settlement.